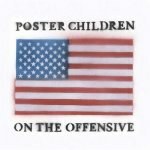 Listening to the Poster Children's mini-album of protest songs dredges up the complicated emotions that many of us have been trying to avoid since the disastrous result of the 2004 Presidential Election. Listening to and reviewing a politically charged record that came out pre-Election Day, after the big Dubya has been re-established in the White House, is a depressing, frustrating, infuriating, and quietly reassuring experience. Part of me wants to toss the disk into the trash can or scratch it all to hell against a cinderblock wall and then return to my self-imposed retreat from current events. Another part wants to break out into hysterical laughter, allowing a few pent-up tears to escape as well, at the thought that all these anti-Bush albums would actually make any difference in voter turnout. As if anyone in the middle chunk of the United States listens to Angry Indie Kids. And then finally, I think, well, he's only allowed four more years, and there's a senate race in 2006, and really, how could Kerry have cleaned up this gigantic mess anyway, and I should just be glad that musicians are willing and happy to speak their minds on issues like these. Hence, the quiet reassurance. I'm glad that artists have seized the microphones that they've always got shoved in their faces anyway, and said/sang/screamed something worthwhile and meaningful -- even if it didn't swing the election. So, obviously, listening to the Poster Children's mini-album of protest songs dredged up the complicated emotions that I think many of us have been trying to avoid since the disastrous result of the 2004 Presidential Election. The album is called On the Offensive, as they and many other bands were in the months preceding November 2. This little release from the Illinois indie rock veterans shows The Poster Children at their sharpest and tightest. They released their ninth studio album at the beginning of 2004, and put out On the Offensive at the end of September. Featuring only six tracks, the band decided to go with covers of early '80s "songs of warning and dissent" rather than overly optimistic protest anthems from the '60s. These songs address the rise of the fundamentalist Religious Right -- an eerie revolution made more frightening by its steady and seemingly unstoppable gathering of power and influence. So instead of the Young Bloods and Quicksilver Messenger Service, The Poster Children chose such classics as "Clampdown" from the Clash, "We Don't Need This Fascist Groove Thang" by Heaven 17 and Husker Du's "Divide and Conquer". Not only did the band pick spot-on songs that speak directly to the politics of fear that currently dominate this country, but singers/band founders Rick and Rose spearhead the urgency conveyed in the original versions of these songs. Guitarist Jim and drummer Matt create exhilarating and tightly wound rhythms and melodies. On the Offensive goes from sarcastic pop on "The New World" to barely contained volatile energy on "Clampdown" and "Let's Have A War". Even without the message, these songs are worth listening to again and again. Stepping back to look at the bigger picture -- looking at what this album was originally meant to do -- is still depressing, frustrating, infuriating and, yes, quietly reassuring. Listening to these six songs post-election definitely calls into question the worth of that whole voter turnout initiative that still resulted in a lost election. But we should also remember that this election saw the largest surge in youth-voter registration in decades. In fact, that age group gave Kerry his only decisive victory. The supposedly apathetic generations X and Y were the angriest and most active in this election. There's no way to tell how much of an effect politically active musicians had on the election, but the fact that artists and young people can be so passionate and vocal and smart keeps that spot of quiet reassurance alive amidst the shocked depression that struck millions immediately following George Bush's re-election.